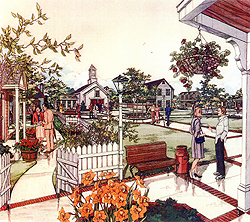 An artist?s rendering shows a village square that would be part of a proposed development on lands south of Bellevue. The Bellevue City Council expressed early skepticism with the idea, saying retail operations there could pull business from the city?s downtown core. Graphic courtesy of David A. Clinger & Associates. Guest opinion by Dennis Davis, M.D.